The DIS-2 310/2 FB is a fully digital AC servo controller for three-phase synchronous motors with a supply voltage of 230Vac. 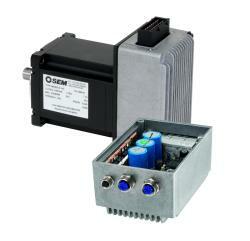 The DIS-2 is optimally suitable for the decentralised applications. It can be mounted directly to the terminal block of the motor or used as a stand alone unit in close proximity to the motor.